LAS VEGAS (AP) — The Las Vegas massacre claimed 58 lives , making it the worst mass shooting in modern U.S. history. Hundreds more were shot, many of them surviving after a mad dash through a sea of chaos, flying bullets and bodies. Others had to be carried out and would be dead themselves had it not been for everyday heroes who risked their own lives to save someone else’s. Jason McMillan has spent a month in a hospital, more than a month in a rehabilitation facility and countless hours in physical therapy trying to regain the use of his legs while coping with stares from passers-by. The 36-year-old Southern California sheriff’s deputy was shot at the Route 91 Harvest Festival while trying to shield his girlfriend from the gunfire raining from a nearby high-rise. He suffered liver and lung wounds and has a bullet in his spine. Seemingly simple things can be onerous, like finding a parking spot and a table with enough space for a wheelchair so they can go out to dinner. But McMillan hasn’t let these hurdles stop him from living. Since the shooting, the father of two got engaged to his girlfriend, bought a home, got a puppy, traveled to Hawaii and learned to scuba dive off the California coast through a program for wounded veterans and law enforcement. McMillan was working as a deputy at the Riverside County courthouse last year when his girlfriend, Fiorella Gaete, now 23, got tickets to attend the festival. Fans of singer Jason Aldean, they made their way toward the front of the packed crowd as he took the stage. When the popping sounds started, McMillan thought it was gunfire but couldn’t tell where it was coming from in the chaos. Seconds later, the speakers shut off and concertgoers began falling to the ground. He made sure Gaete was tucked behind him, and then he was hit, and his body crumpled. He couldn’t feel his legs. Blood poured from his chest. Gaete dragged him to a fence, where others helped lift him to the other side. She jumped over and pulled him by the legs until he was loaded into the back of a pickup truck, which roared toward a hospital. McMillan’s days then passed in a drug-infused blur. He remembers seeing shadows on the other side of the hospital room curtain that reminded him of a silhouette with a gun. When he looked at the floor, he pictured dead bodies. He had feeling in his toes — a sign that he could recover. But if, or when, no one could say. After more than two months in the hospital and rehabilitation, he returned to California. Gaete, who broke her arm, is getting used to being his caretaker and leaving her job while coping with her own memories of that night. Some days have been difficult. McMillan’s can still get down on the floor and play with his two young daughters, but sometimes he’s in too much pain. McMillan said he’s long been a homebody, but that’s changed a bit, too. He recently took a trip to Hawaii and learned how to scuba dive. Gaete is now trying to persuade him to go skydiving with her, and he’s thinking about it. Less than half a year after the shooting, McMillan and Gaete got engaged. They’re planning to get married next year. McMillan said he’d like to return to work but is focusing on therapy to try to get back on his feet. There are desk jobs he could do, but his heart is in manning the courthouse or heading out on patrol. 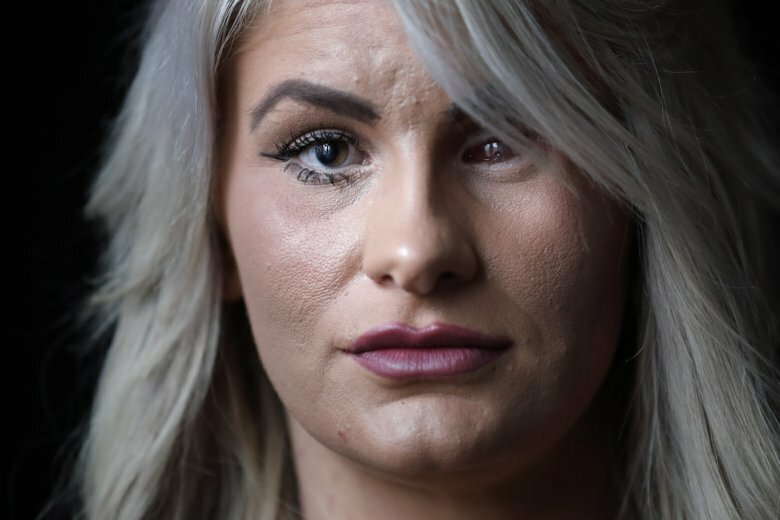 After losing her left eye and getting shot in the other, Chelsea Romo was told it could take more than a year until she could see. But as the anniversary of the attack approaches, she can insert a lens to have nearly perfect vision in one eye, enabling her to read, drive and care for her young son and daughter. In the other, she is getting a hand-painted prosthetic and will soon undergo what could be the last of about half a dozen surgeries to help her heal. It hasn’t been easy for the now-29-year-old. She hasn’t resumed her computer-intensive hospital job, can’t dunk in a swimming pool, and must use the heel of her foot to feel where one stair ends and the next one begins to avoid falling. But, she said, her doctors have called her recovery miraculous. A year ago, Romo was working long hours at a Riverside County, California, hospital handling intakes and insurance. She was going through a divorce while living with her parents and raising two young children. When a friend got tickets to the Las Vegas festival, she headed out for her first weekend away. The pair managed to get up close to the front of the stage at the Jason Aldean show when she heard a sound and looked up. “My girlfriend told me to duck down, and she looked at me and said, ‘Your face,'” Romo recalled. From there, everything turned orange. She could no longer see. An off-duty police officer and others at the concert crafted a gurney from a piece of broken fence and carried her to a golf cart, which took her to an ambulance. Romo’s memory of those moments is blurry. She said she learned some of the details later from the officer, who over the last year has become her best friend. For a week, Romo said she was blind. Her left eye was shattered, and she couldn’t see out of her right. Her faith helped carry her through those moments when doctors told her it could take a year, or more, for her to be able to see. She returned home to California and to more surgery to remove shrapnel from her eye. A week later, she said she could see, and in a month, her vision had improved even more. “They kept telling me this is a miracle,” said Romo, who took her children trick-or-treating on Halloween dressed up as a pirate with a patch covering her missing eye. Over the year, she has had half a dozen surgeries, and there are days where her eye is irritated and she can’t use her lens. Every morning, her 2-year-old daughter wakes up, pulls back her bangs, and asks if her “owie” is OK. Her 6-year-old son worries something could happen to her when she goes out. The year has brought other changes, too. She started a relationship and became close friends with other Californians who survived the shooting. “There are so many people who have become like family,” she said. Now, she’s focused on getting her prosthetic and moving into her own apartment for the first time — just ahead of the anniversary of the shooting. A small home in Las Vegas has become a shrine to Erick Silva, who was killed in the shooting. Photos of the young man wearing security guard uniforms cover the window on the front porch. Newspaper cutouts, handwritten signs and a T-shirt with his photo are visible from the sidewalk, while a white wooden cross and mementos make a makeshift altar next to the front door. Inside, poster-size portraits of Silva hang in the living room he shared with his mom, brother and stepfather. Oct. 1, 2017, transformed this house and the family that calls it home. That day, Silva was working as a security guard at the Route 91 Harvest Festival and was shot while helping people climb over a barricade to escape the gunfire. She remembers like it was yesterday the morning she woke up to find news of the shooting on TV and the neighbor who came by to ask about her son because his truck was not in the driveway. The words of the woman who told her Silva was dead are seared in her memory. Her home, she said, was never the same. Silence has replaced the joy Silva brought to it. Cervantes has tried hard to find a new normal. She and her husband, Gregorio de la Rosa, are back at work. She goes to therapy and talks with church pastors. She even underwent a spiritual cleansing. She wrote three songs in her son’s memory once the stream of visitors ended a few months after the shooting and she found herself alone. She still cries, but she watches how often because she doesn’t want her youngest son to see. They visit Silva’s grave every week, and during a vacation, they took a framed picture of him on the trip and decorated it with scrapbooking stickers. The decorated frame now hangs in Silva’s room next to the shelves that were installed after his death to display some of his belongings and other items. The black tennis shoes at the top of the shelves were the last Silva wore. His empty wallet, cellphone and security guard badges are there, too. There’s also a flashlight, metal detector, cards, candles and four colognes, one still unopened. Parts of the room are frozen in time. Handwritten notes are on the wall just as he had left them. So is a certificate he won for eating a giant burger at a restaurant. The monitor on his desk still shows the feeds of the security cameras he had installed at his parents’ home — nobody knows the password. His mother had to break a locked drawer where he kept important documents. She stored the blankets that he slept with. “They smell like him,” Cervantes said. Her youngest son sometimes does his homework on Silva’s bed. Cervantes carries on her phone pictures showing her son standing next to the stage before the massacre. She proudly shows them to people since her son loved his job. He used part of his paychecks to help his family and, Cervantes said, he would buy her the red lipsticks she likes. He handed her $100 the day before he died. The Route 91 Harvest Festival made for an annual girls’ trip for Jessica Ha and her two girlfriends, who are big country music fans. The 23-year-old Newport Beach, California, resident and her friends managed to make it out of the festival without serious physical injuries. But emotionally and mentally, they’re still processing what happened. When the gunfire broke out, she and her friends dropped to the ground near the stage, where they were standing. A stranger — a young man Ha describes as being in his mid-20s with a flannel shirt — threw his body over hers to shield her. She has no idea who he was, and when the group got up and fled after 10 minutes, she never saw him again. She and her friends ran toward the back of the concert venue, where they helped someone in a wheelchair make their way out, before running toward a nearby casino, where rumors of another shooter sent them fleeing in another direction. She, her friends and about a dozen others eventually ended up in a nearby apartment, where two air ambulance pilots offered the group shelter. They stayed, checking the news and calling family members, until they got word around 5 a.m. that it was safe to leave. Ha and her friends walked back to their hotel, passing shoes, purses and towels left behind by concertgoers. “I’ve never seen the Strip like that. Just quiet. No lights on,” she said. The women collected their things at their hotel and had a somber ride home the next day. They haven’t talked much about that night since. Ha, a human resources recruiter, later found another survivor with whom she could compare stories and process what happened. Another woman who was at the concert came in for a job interview after spending months out of work, trying to cope after the shooting. The women spent an hour comparing stories and bonding. Ha was eventually able to help the woman find a new position she loved — a job placement that Ha said meant more to her than any other. Ha learned about the woman’s hiring while back in Las Vegas in May for the first time since the shooting, looking for some closure. “You would never think coming back to such a tragic location would bring me so much joy,” Ha said. She returned to the concert venue and walked around quietly with her boyfriend, taking in the scene. They noted the “Vegas Strong” messages on signs and bumper stickers throughout the city. “It was honestly really comforting to go back and to feel that love and to really see an entire city understand what you went through,” she said. She said she doesn’t mind talking about what happened but tries not to think about the shooting every day. Instead she’s trying to live her life for those who didn’t make it that night. Ha noted she would like an answer about the gunman’s motive, something Nevada law enforcement say they may never be able to determine. Taxin reported from Menifee and Santa Ana, California. Associated Press writers Gregory Bull in San Diego, Michelle L. Price in Las Vegas and Amanda Myers in Los Angeles contributed to this report. Find complete AP coverage of the Las Vegas mass shooting here: https://apnews.com/tag/LasVegasmassshooting.